WELCOME TO MY DREAM: DAVID BOWIE-Cat people (Putting out fire) (DreamTime Mix v3.0). 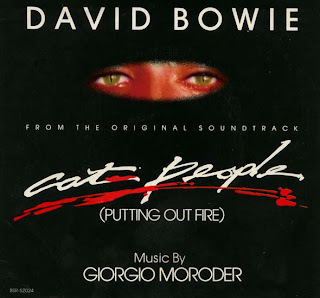 DAVID BOWIE-Cat people (Putting out fire) (DreamTime Mix v3.0). I don't know where or to whom exactly to give credits for this amazing track....to Giorgio Moroder who produced it...to David Bowie for performance...or to Dreamtime for this excellent, long play remix. Maybe best...to all of them. Released on soundtrack for 1982 blockbuster ''Cat people'', as well as on 12'' and 7'' singles. I used to play it a lot in club I worked in late 80's (D.J.) and it was quite amazing how people reacted on it for several years. Posted by request from Theo...and of course for all music lovers around. Enjoy. IF ARTISTS OR THEIR REPRESENTATIVES ARE OPPOSED TO THE POSTING OF THEIR WORK, I WILL REMOVE THE FILE, AFTER NOTIFICATION, IMMEDIATELY! Let's see...although most tracks you'll find here are already so good that needs no more editing...I couldn't resist not to ''crossover'' them. Results are sometimes good...sometimes bad...whatever...it's fun and joy making it. In this crossovers I use simple wave editor and an old PC. It's non proffesional, unofficial hobby. Files available here are for private, non commercial use only and wont be available forever. Please support authors and artists by purchasing original CD's. Welcome to my dream....welcome to Dodi's crossover.